Indonesia is located in Southeast Asia, straddling the equator between Asia and Australia, and between the Pacific and Indian Oceans as well. It is the largest archipelagic country in the world, comprising 13.466 islands. Indonesia is the fourth most populous country in the world, home to more than 259 million people in 2016. More than eighty-seven percent of its population is Muslim, making Indonesia the largest Muslim country in the world. The nation is highly diverse, however, having more than 300 ethnic groups and speaking in more than 700 ethnic languages and dialects. 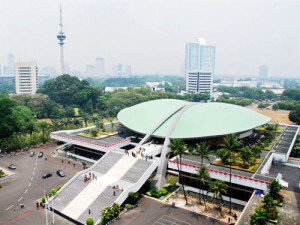 Jakarta is Indonesia‘s capital and largest city. Located on the northwestern part of Java, the area has long sustained human settlement. Historical evidence from Jakarta dates back to the 4th century CE, when it was a Hindu settlement and a port. 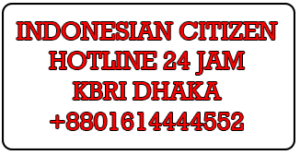 The city has been sequentially claimed by the Indianized kingdom of Tarumanegara, the Hindu Kingdom of Sunda, the Muslim Sultanate of Banten, and by Dutch, Japanese and Indonesian administrations. The Dutch East Indies built up the area before it was taken during World War II by the Empire of Japan and finally became independent as part of Indonesia. As per statistic Indonesia, GDP Growth Rate in Indonesia is reported to have shrunken by is Indonesia’s GDP shrank 1.83 percent quarter-on-quarter in the final quarter of 2015, in comperation to an upwardly revised 3.36 percent expansion in the September quarter but above market expectations of a 1.94 percent contraction. A surge in government spending and a faster increase in investment were unable to offset a sharp slowdown in private consumption and a faster decline in exports. 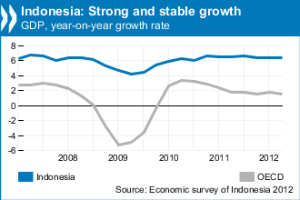 GDP Growth Rate in Indonesia averaged 1.42 percent from 2005 until 2015, reaching an all time high of 3.83 percent in the second quarter of 2014 and a record low of -3.57 percent in the fourth quarter of 2008. Indonesia is the largest economy in South East Asia. The country has been growing standing over the last few years mostly due to high domestic consumption and growth in exports of manufactured products and commodities. This page provides – Indonesia GDP Growth Rate – actual values, historical data, forecast, chart, statistics, economic calendar and news. 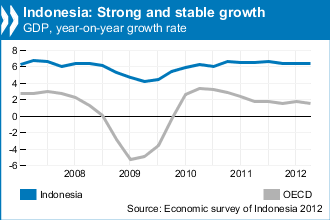 Indonesia GDP Growth Rate – actual data, historical chart and calendar of releases – was last updated on March of 2016. As of 28 June 2010, the Indonesia Stock Exchange had 341 listed companies with a combined market capitalisation of $269.9 billion. At November 2010, two thirds of the market capitalisation was in the form of foreign funds and only around 1% of the Indonesian population have stock investments. Efforts are further being made to improve the business and investment environment. Within the World Bank‘s Doing Business Survey, Indonesia rose to 122 out of 178 countries in 2010, from 129 in the previous year. Despite these efforts, the rank is still below regional peers and an unfavourable investment climate persists. For example, potential foreign investors and their executive staff cannot maintain own bank accounts in Indonesia, unless they are tax-paying local residents (paying tax in Indonesia for their worldwide income). From 1990 to 2010, Indonesian companies have been involved in 3,757 mergers and acquisitions as either acquiror or target with a total known value of $137bn. In 2010, 609 transactions have been announced which is a new record. Numbers had increased by 19% compared to 2009. The value of deals in 2010 was 17 bil. USD which is the second highest number ever. In the entire year of 2012, Indonesia realised total investments $32.5 billion, surpassing its annual target $25 billion, Investment Coordinating Board (BKPM) reported on 22 January. The primary investments were in the mining, transport and chemicals sectors. Pursuing a “free and active” foreign policy, Indonesia has been a member of the United Nations since 1950, as well as a founding member of the Non-Aligned Movement (NAM) and the Organization of the Islamic Cooperation (OIC). It is most active in its relationship with its neighbours, through the Association of South East Asian Nations (ASEAN) and the East Asia Summit, and happens to be a founding member in bath these assosiations, as well as the Asia Pacific Economic Forum (APEC).